I think, for the most part, everyone strives for success. We want to be successful in our professional as well as our personal lives. I strived to be the best possible principal for my students, staff, and community. Whether I was successful is a matter of perspective. My evaluations seemed to support the fact that I might have been. I was far from perfect, but always strived for constant improvement. When I reflect upon what was accomplished during my time leading New Milford High School I think many observers would consider my leadership a success based on what we all accomplished together. Our digital transformation, backed by evidence of improved learner outcomes, has been well documented. In the eyes of many this is success. As I have transitioned into my new role over the past two years as a Senior Fellow for the International Center for Leadership in Education, I continue to set the bar high for myself. Again, whether I am successful is open for debate. Some observers might see the publishing of books as an indicator of success. Others could equate keynotes in the same manner. No matter what someone’s view of success is, I can tell you one thing for certain – it is not a linear process. No one goes from point A to B by following a predetermined path or script. The question then becomes why does school, for the most part, focus on a linear transition that manifests itself in the form of curriculum? This is just one example that flies in the face of unleashing the talents of our students while teaching them what success really is. Success results from a series of experiences that include constructing then applying new knowledge, failure, persistence, commitment, perseverance, adaptation, evolution, and most of all reflection. 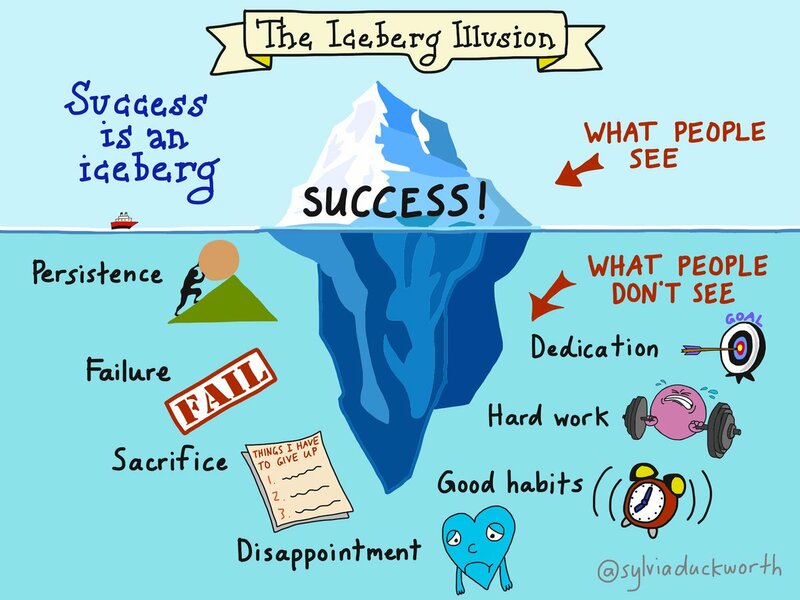 There are so many images out there that illustrate the concept of success being like an iceberg. In the eyes of many people, success is only what you see or a final product. The reality is that success really is a unique combination of behaviors, skills, and mindset shifts. The recipe is different for everyone as well as the criteria used to determine success. The fact remains though that the path to success is always convoluted. Learning and success are intimately intertwined. You can’t be successful if you don’t learn. You learn to eventually experience some sort of success in life. 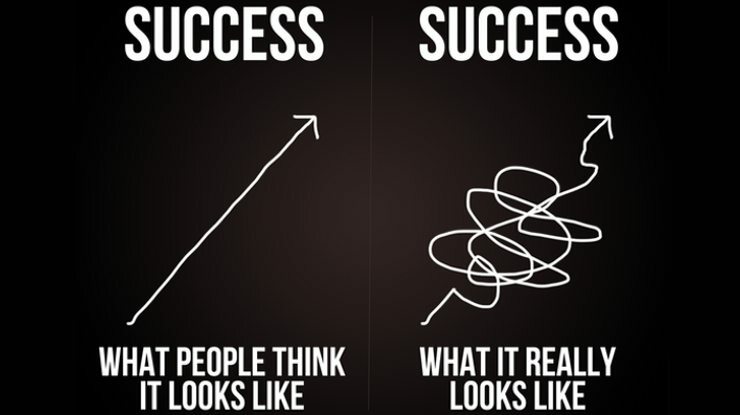 Learning, like success, is anything but a linear process. As such we need to be more mindful of the experiences and structures in our schools if the goal, which it should be, is to prepare students to succeed in their future. This includes the new world of work where in a few short years many of the jobs that exist today won’t. If we continue to prescribe students to a one-size-fits-all approach in classrooms that have remained relatively unchanged we are in a sense forcing them down a linear path. Instead of a focus on learn to do, schools need to shift their practices and create a culture where students do to learn. Students learn differently and have hidden talents that we must unleash. This is why I love the maker movement and makerspaces in particular. Nothing, in my opinion, illustrates to kids the many pathways to success than learning with their hands through trial and error, open-ended exploration, and authentic problem solving. Education needs some disruptive innovation. We must lend a critical eye to our pedagogy, especially the way we assess and provide feedback to students. It is time for us to work harder to upend the status quo by redefining success in learning. Are you with me? Technology is a fantastic tool that when integrated with purpose can support and enhance learning in ways that many of us never imagined. With all tools, there are limitations as to what they can do. As I have said over and over, I truly believe that pedagogy trumps technology, especially in the classroom. Success is inherent upon how students and educators use tools to transform teaching, learning, and leadership. The successful digital transformation that took place at my school is well documented. However, I am the first to acknowledge that the most significant catalyst for change that resulted from our entry into the edtech world was a new lens to critically reflect on professional practice. All of the above elements are critical in determining that there is a Return on Instruction (ROI), which is evidence of improved student learning outcomes when integrating technology. Integrating technology and innovating just for the sake of it will never pay off in the long run. If we don’t hold others and ourselves accountable for purposeful technology integration aligned to real results, we run the risk of precious time and money being wasted. Schools and educators across the world are doing amazing things with technology. We must always be cognizant of the way in which technology is integrated. Does technology support high-level learning? Are students using technology to demonstrate conceptual mastery in ways that they couldn’t without it? How do we know if teaching, learning, and leadership have changed in order to unlock to full potential of technology? For all intents and purposes I had a great K-12 education. I got relatively good grades, stayed out of trouble, and participated in a wide range of sports and extracurricular activities. Best of all though were some of the amazing teachers and administrators I had during those years who consistently showed they cared. In the end I was deemed college ready and was accepted to almost all of the schools to which I had applied. I was so excited to attend Salisbury University in Maryland and study Marine Biology as I was so intrigued by this area of study. I was again surrounded by some great educators and went on my way to further study in the sciences, eventually finding my way to the field of education. As I think back many years later, I have now realized that I was good at school. The system worked the way it was designed. It worked for me, or so I thought. Never was there any question about what I was learning or even why. It was just accepted that this was how school was supposed to be. Conformity and compliance were well ingrained into the culture of school. As I continue to reflect, I now ponder whether or not I would be successful in a K-12 system today. Things have really changed as a result of advances in technology. The process of going through the motions of doing school the way I did it would have been a monumental challenge in my opinion. Do students value school today? With exponential changes to technology and the ubiquitous access to information will students of the future value it? What really got me thinking about the value of school was the video below. I am not saying that I agree with everything in it, but there are many points that really resonated with me. Now try to think back to when you were a student and what you learned. How much of what you learned do you actually use today? Even though progress is being made and innovative practices are being implemented in schools across the globe, we still must look at the big picture of education. There should be inherent value in what students learn today as they need to have the skills, mindset, and confidence to succeed in the new world of work. If anything in the above video resonates with you, then engage your students in a conversation about the value of school. I recently had the honor of being a guest on Dr. Will Deyamport’s podcast called the Dr. Will Show. You can view the Google Hangout video HERE. We had a vibrant conversation on the topic of Digital Leadership with a focus on school culture, embracing change, strategic use of social media, the Model Schools Conference, and innovation. A major theme that resonated throughout our discussion was the importance of becoming a connected educator and how this in itself can be a powerful catalyst for meaningful change. If you watch the video you will see light-hearted back and forth banter between Will and me. He totally deserved the grief I gave him as it only took about five years for him to actually invite me onto his show. In all seriousness though, something Will said to me really resonated. At one point during our conversation he told me how much it meant to him when I gave him a shout out during my keynote at the 2013 Mississippi Educational Computing Association Conference. To be honest, I really didn’t remember doing this as I routinely try to promote the great work of educators I know every opportunity I get. This made me reflect on the journey Will and I have taken together as connected educators and the resulting relationship we have cultivated. Will and I met virtually on Twitter way back in 2009. At the time he was known as @peoplegogy on Twitter. I remember vividly sitting at my desk when I was a principal and seeing Will tweet out each morning “How is the coffee brewing?” Our connection began like many other educators who use social media as part of a Personal Learning Network – we wanted to learn, grow, and get better. Over time we began to communicate and collaborate across an array of social media networks exchanging ideas, providing support, and dispensing out advice. I can’t even count the number of times we have now connected over the years just to check in on one another. A professional relationship was cultivated. I always admired Will’s passion for educational technology and genuine interest in becoming a better educator. There are so many benefits associated with becoming a connected educator regardless of your role. Professional relationships based on a mutual desire to improve professional practice are probably the most important outcome in my opinion. Through every connection you get new sets of virtual ears to vent to and shoulders to lean on. Silos or isolated islands are often a fact for many of us during the daily grind. A focus on innovative practices also tends to create a lonely place for educators who go against the flow. Not having a virtual network to complement our face-to-face relationships just seems silly to me now. Over the years Will and I have gotten to know each other quite well. Our professional relationship eventually blossomed into a great friendship. When I moved to Texas I drove down from New York City with my twin brother. As I was looking at our route I noticed that we would be driving through Hattiesburg, MS. I didn’t think twice about reaching out to Will and inviting him and his wife to join my brother and me in his hometown for lunch and some brews. As I think about this story I am overwhelmed by how many other professional relationships forged through social media have resulted in great friendships. Becoming a connected educator has definitely resulted in an exponential increase in professional relationships for me. Each of these connections over the years helped give me the knowledge, skills, and motivation to lead a successful digital transformation at my former school. These relationships also assisted me in overcoming fears such as writing, public speaking, and failure. I am who I am today in part because of the connected network of amazing educators I have come to know over time like Will. It is important to embrace a connected mindset ourselves and then help others build professional relationships themselves as part of a digital leadership strategy. As appreciative as I am about the professional connections I have made, it is the personal relationships and resulting friendships that I have formed that I cherish the most. Focus on building better professional and personal relationships with any and all means (or tools) at your disposal. In the end you will be stronger, more confident, and inspired as you journey down the path of professional and personal growth. Another Christmas has passed and I am continually amazed by the technologies that kids now have access to. For example, my son received a drone from my mother-in-law and has been playing with it non-stop for days now. At first, he was focused on just the basics of flying the device. After having mastered take off, landing, and balance, his focus now is on using the camera to take photos and video. It is awesome to see how engaged he is with the drone, but that he is also learning in the process. Technology for him, like most kids today, has become an embedded component of their lives. They have grown up in a world where they have become accustomed to the fast-paced evolution of everything digital. The world as we know it has fundamentally changed our learners. It is not that they are learning differently per say, but the environment in which they learn has dramatically changed. The challenge for educators and schools today is to make learning REAL (relevant, engaging, authentic, and lasting) for all students and aligning it more with their world. A great deal of emphasis has been placed on personalized opportunities for students. Whereas there are many benefits with this approach, the reliance on technology platform and human interaction can take away from intended outcomes. REAL learning places a greater emphasis on making learning personal for students. Provide students access to real-world tools to do real-world work (i.e. makerspaces). Allow students to select the best tool to complete a learning task while moving away from a one-size-product-fits-all approach. Provide meaningful feedback in a timely fashion. Connect standards and learning outcomes to their interests and passions. Implement Academy programs (school within a school). Offer virtual course options and innovative self-paced learning opportunities in lieu of traditional independent study programs (i.e. IOCS). Transform outdoor spaces into flexible classrooms and stimulating learning environments. Broaden student horizons by bringing in experts both face-to-face and virtually who work in emerging fields of work. Take kids on field trips through virtual reality technology. Move away from traditional grading and homework practices. Clearly articulate the “why” all the time so that students understand how what they are learning impacts them now and in the future. REAL learning should be a reality for all of our students. What would you add to the list I have started above?